With our journey of visiting fifty-two churches over, I can reflect more on the complete experience. 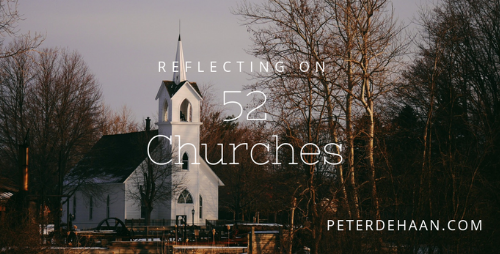 Today, I’ll add to my thoughts about Church #38. So many elements of this church excite me: a message with substance, elements in the service that pointed me to the worship of God, significant community before and after the service, meeting in a school (and not owning a building), and a group of people that shun status quo religion. I felt so at home. This church could easily become my new faith community. I want to say this is the future of the church, reimagining it for the next generation. Yet for all its appeal and innovation, the key elements of the modern church still exist: gathering for a Sunday service, having a worship team lead us in singing, and hearing a message from a trained minister. This isn’t a new way of doing church but merely a fresh iteration within established norms. This isn’t the overhaul the modern church needs but merely a fresh coat of paint. Although it looks nice and feels inviting, I yearn for more. If reimagining church falls short, perhaps we need to go back to the beginning and reinterpret what true church should be.